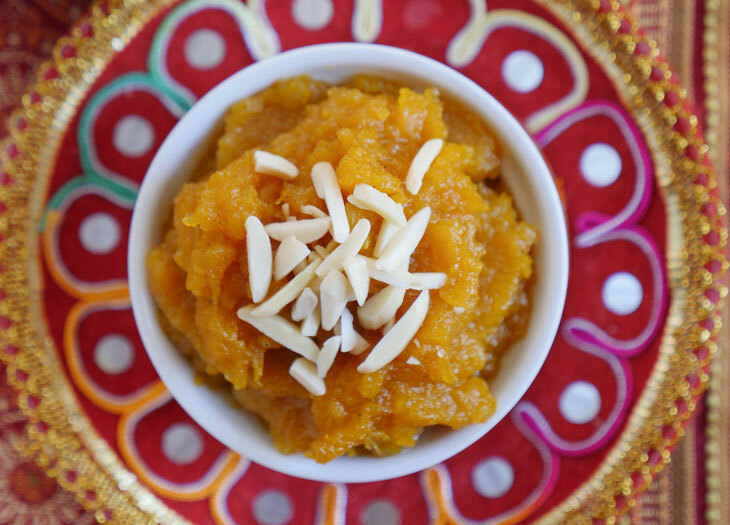 This is a very rich halwa and so while I say that it serves 2-3, you can easily serve it to a family of four by adding some ice cream to go along with it. I usually buy pre-cut butternut squash from the grocery store as it makes this an even easier dessert to make. To prepare the squash, add 2 cups water into the steel inner pot, then place a steamer basket into the pot. Place the peeled and cut squash in the basket. Secure the lid, close the pressure valve, press the steam button and set the time to 15 minutes at high pressure. Remove the squash and steamer basket from the pot. Set the squash aside for now. Dump out any water still remaining in the bottom of the pot. Press the sauté button and add the ghee and the squash. Mash the soft squash with a spoon, then add sugar and cardamom. Stir-fry for 3-4 minutes, or until the halwa turns a shade darker and the ghee releases a nutty aroma. Garnish with crushed nuts and serve. You can always add more sugar if you prefer a sweeter halwa.